Topics: Clinton Research, Julie Czerneda, Derwin Mak, and Tony Pi. The Endurance International Group Inc (Massachusetts, Burlington) is the location of the Nginx server. There are 2 Nameservers, ns2.netfirms.com, and ns1.netfirms.com. 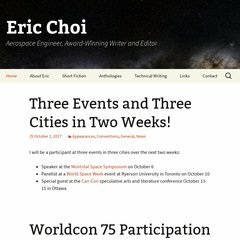 Aerospacewriter.ca's server IP number is 66.96.160.143.